The External Advisory Committee (EAC) consists of industry and government professionals who hold responsible engineering positions in industry or government laboratories. One of the most useful functions of the advisory committee is to provide dialogue between students and practitioners of the profession. The committee structure provides a means for faculty to learn about technical, business, and philosophical trends taking place in industry. Similarly, the committee provides a format in which the department can inform industry about current thinking in academia. EAC meetings are held on campus twice each year. 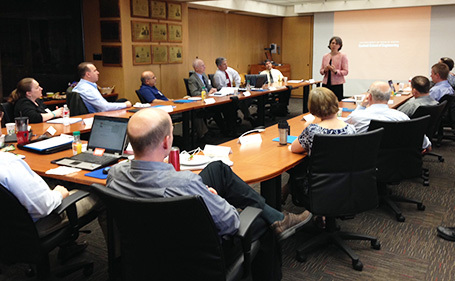 Dean Sharon Wood presents a Cockrell School update during an EAC meeting.